Marion Goss and William H. Gillum’s friendship arose through surprising circumstances, given that Gillum had served in the Confederate army. Born on November 22, 1847, in Augusta County, Virginia, Gillum was the son of Dr. Pleasant G. Gillum, another UVA School of Medicine alumnus. William H. Gillum’s grandfather was a successful planter and an early settler of Albemarle County. Exactly one day before Jacob D. Mater enlisted in the 149th Indiana, Gillum enlisted in the Staunton Artillery of the Confederate army on January 24, 1865. Gillum was present at Robert E. Lee’s surrender at Appomattox, and his name appears on a list of paroled prisoners. Like his father, Gillum enrolled in the UVA Medical School in 1867. The following year, he transferred to the College of Physicians and Surgeons in Baltimore, Maryland, from which he graduated in 1869. Gillum then returned to Augusta County to practice medicine. In June 1873, Gillum moved to Parke County with his younger brother and sister and almost immediately befriended Goss and Mater. On February 17, 1874, Gillum married Rebecca M. Randolph, a Virginian by birth who had moved to Parke County with her stepfather in 1865. She gave birth to their son John Randolph Gillum in July 1878. Their son went on to also practice medicine and served in World War I. After the defeat of the Confederacy, Gillum enthusiastically devoted himself to supporting the United States. McFaddin observed that, “Such men as he helped efface the Mason and Dixon line. True and loyal soldier of a lost cause as he was—true and loyal citizen of the United Republic, he was from the surrender at Appomattox to his death. To him there was but one nation, one Republic and one flag.” Gillum supported the Union with such fervor after the war that the veterans of the 14th Indiana unanimously voted him an honorary member of their regiment. Although the Grand Army of the Republic (GAR) officially barred all Confederate veterans from membership, Gillum nevertheless was elected an honorary member of the local Steele Post. Furthermore, he served on the Parke County pension board, “where he was always found the true friend of the brave men who wore the blue.” Gillum was a founding member of the Rockville chapter of the Knights of Pythias, a reconciliationist fraternal society. When Ulysses S. Grant died in 1885, Gillum gave a speech commending the former president and general-in-chief. For the people of Parke County, Gillum embodied the spirit of reconciliation and symbolized the reunited nation. By his death on March 27, 1917, Gillum had become one of Parke County’s most respected and beloved citizens. He served as Parke County Health Commissioner and Chairman of the Parke County Democrats. At his funeral, GAR members acted as pallbearers. Crucially, Gillum accepted reconciliation on northern terms, which endeared him to the people of Parke County. Immediately after the war, Gillum professed loyalty to the United States. Unlike “unreconstructed” Confederate veterans who rejected northern political authority, Gillum accepted his defeat with grace and focused on serving the Union. In the eyes of his adopted county, Gillum embodied the aim—the return of errant Southerners to the national fold—for which their soldiers fought. He fully supported the reunited nation, participated in its democratic institutions, and served the county with his profession. Gillum’s service in the Confederate army and subsequent reform to the cause of Union made him an emblem of peace and reunification in the eyes of Parke County, at a time when a national cult of reconciliation was at the peak of its popularity. From the moment he moved to Indiana, Gillum enjoyed the friendship and professional support of Goss and Mater. Yet while Gillum prospered, Goss suffered a series of personal dramas and misfortunes. Not long after the birth of their daughter Ida, the Gosses’ marriage began to crumble. After living apart for several years, Goss divorced his wife Mary on February 17, 1886. The court granted Goss sole custody of his daughter. 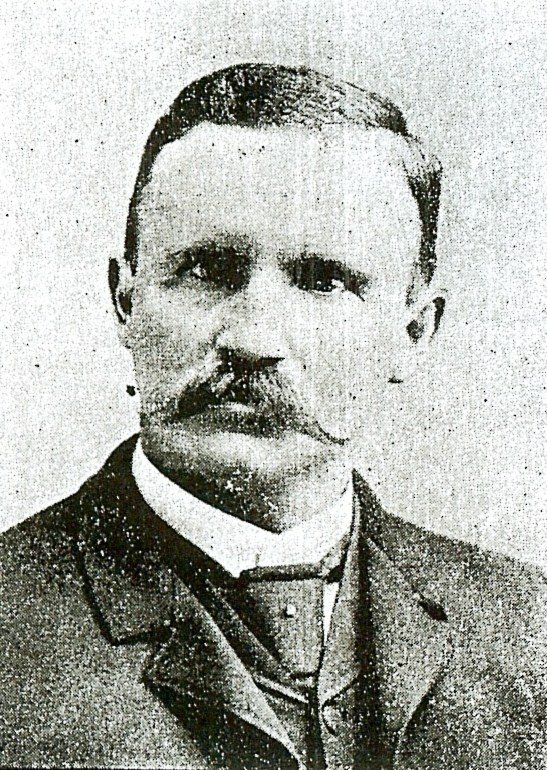 Following his divorce, Goss moved to Topeka, Kansas, for a short while in 1887 to practice medicine. While living in Kansas he connected with a woman named Sarah B. Hefferlin. Born in March 1861 as Sarah S. Blake, Mrs. Hefferlin grew up in Putnam and Parke Counties in Indiana. She had known of Goss during her youth, though they had never formed a personal relationship. While Goss travelled West in search of better health, he and Sarah began exchanging letters. After Sarah’s husband divorced her, the two decided to marry. On April 10, 1889 in Alma, Kansas, Goss married Sarah, who was fourteen years his junior. Sarah gave birth to a son Morgan Blake Goss on November 9, 1890. The younger Goss went on to become an auto mechanic working in Detroit. Like Gillum’s son, Morgan B. Goss served in World War I. In 1890, Goss served as the Parke County Health Officer in addition to his role as president of the Parke County Medical Society. Despite Goss’s divorce from Mater’s cousin Mary, the two veterans appeared to maintain a strong friendship and professional relationship. Gillum, Goss, and Mater regularly worked together and actively participated in the medical society. Goss and Gillum frequently socialized at meetings of the Rockville Shakespeare Club. In early 1891, Goss suffered from another health flare-up that included malarial fever and rheumatism. Goss once again travelled West and found moderate relief for his pain. Like Goss, Mater also suffered from health problems that stemmed from his Civil War service. As early as 1876, Gillum treated Mater for lung troubles. Given Gillum’s involvement with the pension board, he may have encouraged his friend to apply for an invalid pension. Although originally denied, Mater eventually received a pension beginning May 15, 1890. Gillum testified on Mater’s behalf in his pension file. Mater died on April 14, 1914 in Bridgeton, Indiana, of myocarditis. After his death, Mater’s widow Isabel continued to receive a pension for his service. For unknown reasons, Goss did not apply for a pension until over a dozen years after Mater. By the beginning of the new century, Goss and Gillum worked in close partnership, both in their practice and in the medical society leadership. Perhaps at Gillum’s insisting, Goss finally applied for a pension, which he received beginning in 1904. As with Mater, Gillum testified on Goss’s behalf. Goss also received several pension increases as his health further deteriorated. When Goss petitioned for a pension increase in 1908, he enlisted the help of Republican Congressman Elias S. Holliday. On September 16, 1907, Goss suffered a stroke that resulted in partial paralysis. In a strange coincidence, Joseph Noble’s fatal stroke occurred within days of Goss. Even from separate states, that this fact was noted in Goss’s obituary indicates that the two men had enjoyed a strong friendship even after Noble left for Missouri. While Goss officially retained his position as president of the Parke County Medical Society, Gillum performed most of Goss’s duties. When Goss lost use of his motor skills, Gillum began signing his friend’s name on his behalf. Goss’s condition gradually worsened and by the fall of 1908, he could barely speak. Goss died on December 13, 1908 of Bright’s Disease at his home in Rockville, Indiana. The Steele Post GAR handled his burial service. His widow Sarah received a pension for her husband’s service until her death on November 29, 1930. Gillum and Mater had both testified on behalf of Sarah’s claim. Another 149th veteran, John M. Mershon, recounted everywhere he and Goss were posted and attested to Goss’s health difficulties during the war. When the pension special investigator accusingly asked how Mershon could remember so many details, Mershon vigorously shouted, “My goodness! man!! One don’t forget all about his army services.” Even after death, the men of Company I of the 149th Indiana maintained an inseparable bond. Goss, Noble, and Mater were three of only a handful of UVA Unionists who attended the University after the war. They concluded that the education they would receive at the University of Virginia School of Medicine outweighed any fears of prejudice or anti-northern hostility prevalent at the University during Reconstruction. John Wilcox’s mentorship assuaged their concerns and nurtured their budding medical talents. As a former outcast himself, Wilcox invested deeply in his students. Thanks to their UVA education, the three men from the 149th Indiana became some of the most well-respected doctors in the state. When Gillum arrived in Parke County, they appeared to have welcomed him with open arms. Gillum proudly professed his dedication to the Union in spite of his Confederate service, which elevated the Union veterans’ opinion of their new contemporary and fellow UVA alumnus. Gillum’s dedication to Union veteran organizations and loyalty to his friends proved crucial in Goss and Mater’s attempts to secure pensions. For the Parke County veterans, their friendship with Gillum symbolized the possibility of post-war reconciliation. Images: (1) Marion Goss (user submitted photo on Ancestry.com); (2) William H. Gillum’s Appomattox parole record (courtesy National Archives); (3) Dr. William H. Gillum (Obituary, The Rockville Republican, March 28, 1917); (4) Excerpt from Dr. Gillum’s testimony on behalf of Jacob D. Mater (courtesy National Archives). Citations: Compiled Service Records for Marion Goss, Jacob D. Mater, and Joseph Noble, RG 94, National Archives and Records Administration, Washington, D.C.; Compiled Service Record for William H. Gillum, RG 94 National Archives and Records Administration, Washington, D.C., accessed through Fold3.com; Pension records for Marion Goss and Jacob D. Mater, RG 15, National Archives and Records Administration; United States Census, 1850, 1860, 1870, 1880, 1900, and 1910, accessed through Ancestry.com; “William Henry Gillum,” UVA Student Catalogue, Jefferson's University: Early Life, http://juel.iath.virginia.edu/public_person?person=42686#m1; Parke County Historical Society, Parke County, Indiana: History and Families, 1821-1989 (1989); Hiram Williams Beckwith, History of Vigo and Parke Counties, Together with Historic Notes on the Wabash Valley (1880); Parke County INGenWeb, http://www.ingenweb.org/inparke/; The Rockville Tribune Dec 23, 1908-1927, accessed through the Rockville Public Library; The Rockville Republican, 1908-1930, accessed through the Rockville Public Library; Parke County Times, 1917, accessed through the Rockville Public Library; Chapman Bros., Portrait and Biographical Record of Montgomery, Parke and Fountain Counties, (1893); The Terre Haute Tribune, 1956, accessed through Newspapers.com; “Morgan B. Goss,” Memorial # 81700179, accessed on FindAGrave.com; Draft Registration for Morgan B. Goss, RG 147, National Archives at St. Louis, St. Louis, MO; The Terre Haute Express, 1888, accessed through Hoosier State Chronicles; The Grand Army Blue-Book: Containing the Rules and Regulations… (1902); B. F. Bowen & Co, History of Parke and Vermillion Counties, Indiana: With Historical Sketches of Representative Citizens and Genealogical Records of Many of the Old Families (1913); Indiana State Board of Health, Ninth Annual Report, (1890).